The daughter of Robert F. Kennedy shares personal remembrances of her father and through conversations with politicians, media personalities, celebrities and leaders, explores the influence that he continues to have on the issues at the heart of America's identity. Fifty years later, Robert Kennedy's passions and concerns and the issues he championed are -- for better and worse-still so relevant. 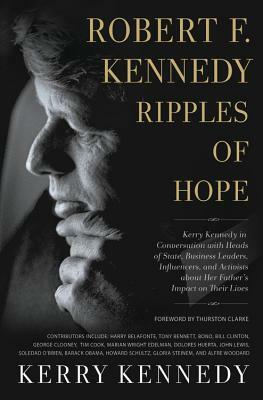 Ripples of Hope explores Kennedy's influence on issues at the heart of America's identity today, including moral courage, economic and social justice, the role of government, international relations, youth, violence, and support for minority groups, among other salient topics. Ripples of Hope captures the legacy of former senator and U.S. attorney general Robert F. Kennedy through commentary from his daughter, as well as interviews with dozens of prominent national and international figures who have been inspired by him. They include Barack Obama, John Lewis, Marian Wright Edelman, Alfre Woodard, Harry Belafonte, Bono, George Clooney, Gloria Steinem, and more. They share personal accounts and stories of how Kennedy's words, life, and values have influenced their lives, choices, and actions. Through these interviews, Kerry Kennedy aims to enlighten people anew about her father's legacy and bring to life RFK's values and passions, using as milestones the end of his last campaign and a life that was cut off much too soon. Thurston Clarke provides a powerful foreword to the book with his previous reporting on RFK's funeral train. Kerry Kennedy is the president of Robert F. Kennedy Human Rights. Since 1981, she has worked on diverse human rights issues including child labor, disappearances, indigenous land rights, judicial independence, freedom of expression, ethnic violence, impunity, women's rights, and the environment. Kennedy founded RFK Compass, which convenes biannual meetings of institutional investors who collectively control $5 to $7 trillion in assets to address the impact of human rights violations on investment outcomes. She serves on the boards of the U.S. Institute of Peace, Human Rights First, Ethics in Action, SDG USA, Sustainable Development Goals Center for Africa, Health eVillages, and the Kailash Satyarthi Children's Foundation as well as several public companies. A graduate of Brown University and Boston College Law School, she received the Medal for Social Activism from the World Summit of Nobel Peace Laureates along with many other awards and honorary degrees. Kennedy is the mother of three daughters, Cara, Mariah, and Michaela. She lives in New York, NY.